Updated furnished condo down to the stainless kitchen, washer/dryer and extra freezer for added space. 3 King Size beds complete with Tommy Bahama Bedding! The view from the deck is spectacular. 1) ALL 3 BEDROOMS HAVE KING SIZE PILLOW TOP BEDS FOR A GREAT NIGHTS SLEEP. Whether you’re looking for a summer vacation, golf trip or a weekend get a way….look no further, you have found the right place. Make your reservations before everything is booked! 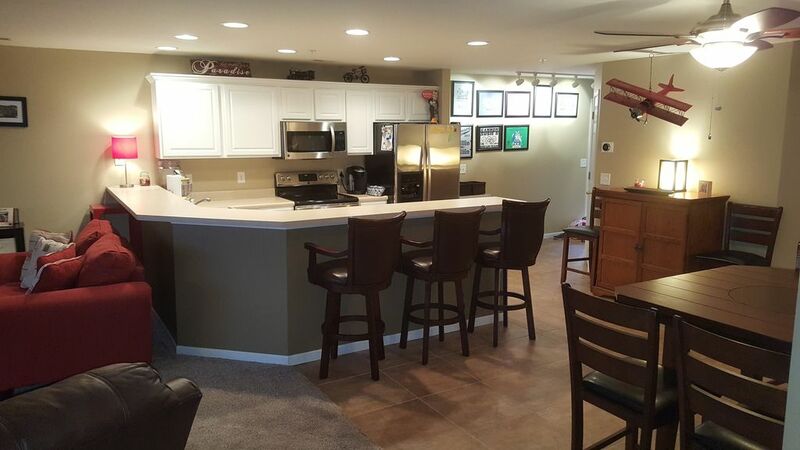 Our condo is a 3 Bedroom 2 bath end unit with plenty of space and perfect for two families or 3 couples. Relaxation & Fun is at the heart of our condo living. Our condo is well equipped as we use it ourselves so it’s not a striped down rental with the bare bones. The complex is in a great location on the lake for boating and secluded from road traffic. In addition to the many amenities, you have access to a 12x32 boatslip. If you are coming to the lake for boating, we are located on the 8-mile marker of the Big Niangua arm of the lake. The water is very calm and is the nicest water for enjoying your boating, skiing, tubing or just 'hanging out' in the cove. Is Fishing in your plans? Crappie and bass fishing are at its finest, and there is plenty of room to fish from the shore, off the dock, or in your boat. If golf is your game, there are two very nice golf courses right next door. Old Kinderhook Resort is one of the lake area premiers courses. If you need more than two, don't worry ... there are plenty more within a 15-20 minute drive. If a little pampering is what your looking for, Old Kinderhook spa, Elements is first class. Do you want more than water fun? Well, Ha Ha Tonka State Park is only 4 miles away, where you can take a leisurely hike, see the remnants of a historical castle, or simply enjoy a natural cold-water spring that leads into the Lake of the Ozarks. Is shopping your deal? It is a short 20-minute drive to the Osage Beach Outlet Mall, One of Missouri’s largest outlet mall. Along the way you will find plenty of specialty shops for you to stop and shop. And if eating out is in your plans, there are many restaurants to choose from and which cater to every taste and style. Looking for more land based family fun? Then take a short drive for the Go-Kart Track, Miniature Golf, Water Park, or a visit to the ice cream stand? All are within a 10-minute drive. Thanks for your interest in our Condo, and we hope you enjoy your visit to the Lake of the Ozarks. The condo sits on the lakefront with an spatculare view of the lake as the lake makes a sweeping bend. Great for watching all the water activity. Digital thermostat for easy use and ceiling fans in all the rooms. Washer and dryer in the unit for convenience so just pack what you need. Brand new stainless dishwasher purchased for it's extra quite rating. Big full kitchen with a wrap around eat at bar that seats 6. The dining table has ample seating for 6. A spectacular view from the deck and the deck is screened in and the floor is tiled. There are 2 swimming pools in the complex and both can be seen from the condo. Both are a short walk from the condo. The condo was very clean and incredibly spacious! Fully furnished with anything you could possibly need during your stay. Wonderful screened in patio with grill in condo itself, and the condominium also has a large pavilion with fire pit, swings, tables, and chairs just a short walk from this specific condo. Located right on the water, and 20 minutes from Outlet Mall shopping. Would stay here again in a heartbeat! Great place to stay, would stay there again just wish we could of had better weather. Easy to find and very few steps to get in and out of condo. This place was perfect! There were 8 of us (4 adults and 4 kids) and we all fit comfortably. The beds are really comfortable and the property has everything you need. We loved playing cards on the screened in deck-the views were awesome! Jeff was easily accessible if we had a question. We will be staying here again in the future! Great place on the quiet side of the lake. Great location, the condo was perfect for our party of 7. The Condo was stocked with anything we could need for our stay. The only down side was the boat access was a bit of a drive away. Would definitely stay here again. The unit was roomy and decorated really nice! We will be back! The Fain family was great to work with. We'd welcome them back at any time. Rates are subject to change until reservation is confirmed. Optional 32' x 12' boat slip available upon request for $15/night.